PLOT: When two trash-picking boys from Rio’s slums find a wallet in amongst the daily detritus of their local dump, little do they imagine that their lives are about to change forever. But when the local police show up, offering a handsome reward for the wallet’s return, the boys, Rafael and Gardo, realise that what they’ve found must be important. When some marketing exec for Slumdog Millionaire came up with the slogan ‘The feelgood movie of the year’, they couldn’t have been more wrong. Despite being just as graphic in the horror of slum living, Trash would be far more worthy of that kind of moniker. 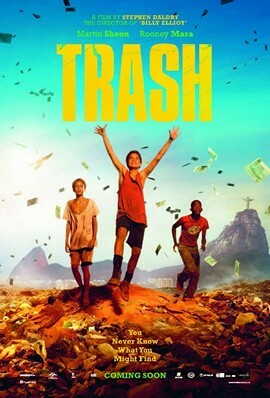 Superb performances from the three real life slumdog’s and some of the most beautiful visuals make Trash very accessible, despite being about 80% subtitled.